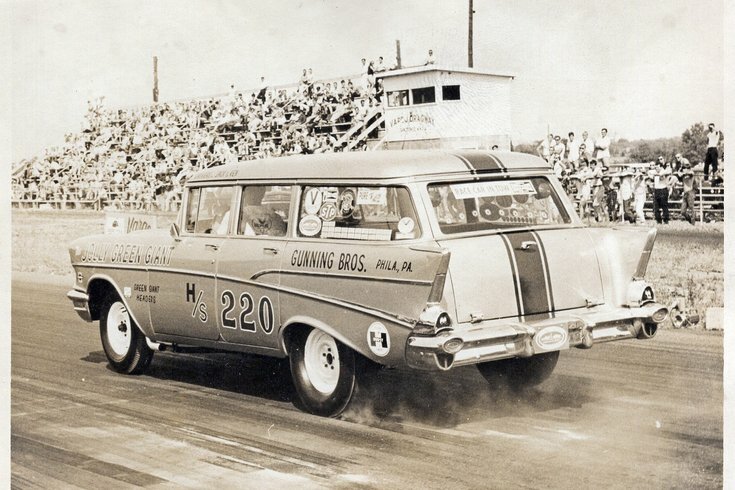 “Jolly Green Giant” at Vargo Dragway, 1966. On Saturday, May 12, the Mercer Museum in Doylestown will open a new, original exhibit called "Racing: A Need for Speed." It will examine the history and culture of racing – foot racing, horse racing, bicycle racing and motor sports – in Bucks County and the Delaware Valley. The exhibit will feature the personal stories of former local racers, like auto racing legend Mario Andretti and Villanova track coach Marty Stern. Andretti, who lived in Nazareth, Pa., is one of only two drivers to have won races in Formula One, IndyCar, World Sportscar Championship and NASCAR. Stern – during his career at Central Buck East High School, Delaware Valley College and Villanova University – coached 145 All-Americans, 21 individual NCAA champions, 12 collegiate record holders, 13 Olympians and four world champions. While getting a history lesson, visitors will also have the opportunity to get up-close to vintage cars, vintage racing gear, trophies and historic images. "The exhibition will take visitors on a fascinating journey, from the footraces of Native Americans to the horse tracks and fairgrounds of the 1800s to the auto speedways and bicycle velodromes of the 20th century," stated Cory Amsler, the Mercer Museum’s Vice President for Collections and Interpretation. Museum admission is $15 for adults, $13 for seniors and $8 for youth age 6-17. "Racing: A Need for Speed"